Back-to-School sales are upon us, and this stationery lover is in heaven. 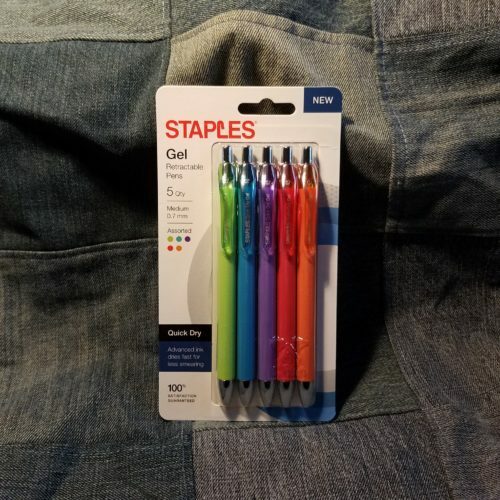 A great side of the BTSS is that this is a time when companies like Staples push out their knock-off versions of more expensive well loved stationery items, in this case, I believe these are a challenge to Paper Mate Inkjoy Gel pens. I’ve mentioned that the Inkjoy looks like an adult “toy” and in comparison the QDGP is Spencer’s gifts version. 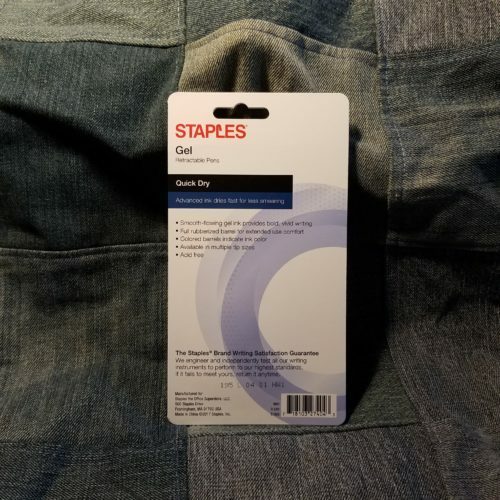 It reminds me strongly of the Papermate gray FlexGrip pen we used to get in the 90s. With the exception of the incised lines of the FlexGrip, this pen is nearly identical to the 90s version of the capped pen. His school me loved the rubberized barrel and fiddling with the incised lines in the grip. 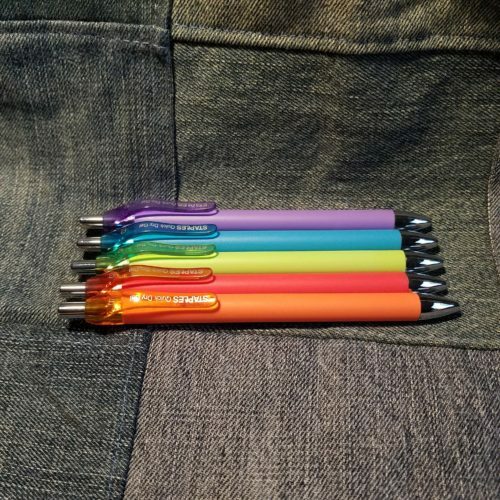 Adult me took one look at the pen and thought, “Basic.” Then I wondered what the hell the design team was thinking. Shiny silver nose, matte rubberized body, colored translucent clip and knock section, then finish it off with a shiny silver knock. The diameter of the pen is thick and about the same as the Inkjoy. They are incredibly lightweight you can barely feel them in hand. The clip is next to useless. 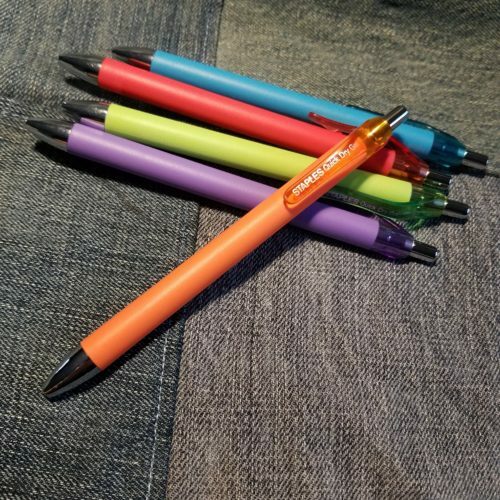 The nock delivers a satisfying click and is nicely springy feeling. The colors are lovely, saturated and sharp on all the paper used. The color of the ink doesn’t match the body of the pen. Particularly the light blue pen body- the ink is closer to teal. The purple is very dark. The red is dark red and not pink. The orange is the only one that is the right shade. The experience of writing is a little less positive. The tip is a tad scratchy on several of the pens in my package. In particular the bright green and the blue were quite scratchy. The colors are water soluble even after drying for an extended period of time. I doubt that they are lightfast. 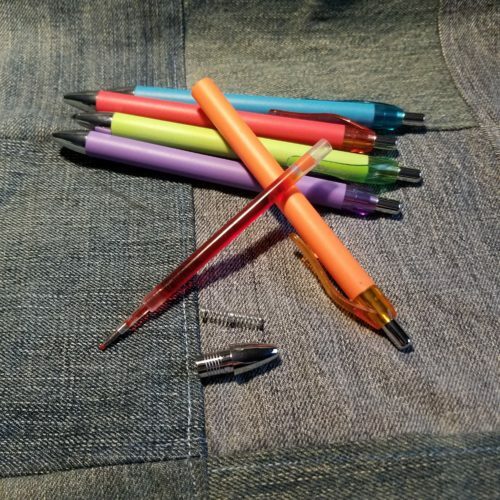 Inside the body of the pen are standard gel refills. I noticed that the scratchy pens had air bubbles near the tips and no amount of shaking and flicking of the pen moved that air bubble. We’ll see if use moves it and if the pen gets better after the bubble is moved. 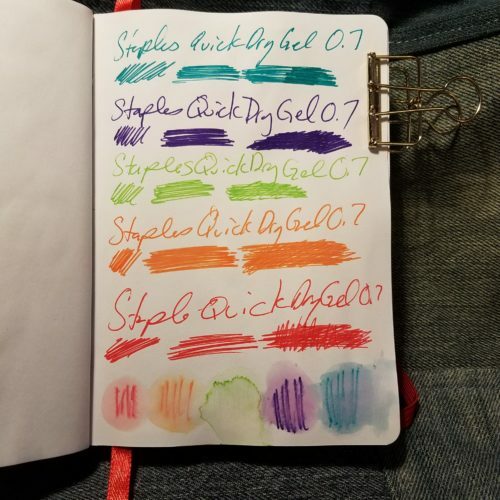 This entry was posted in Review and tagged bullet journal, cheap on 20180802 by leslie. 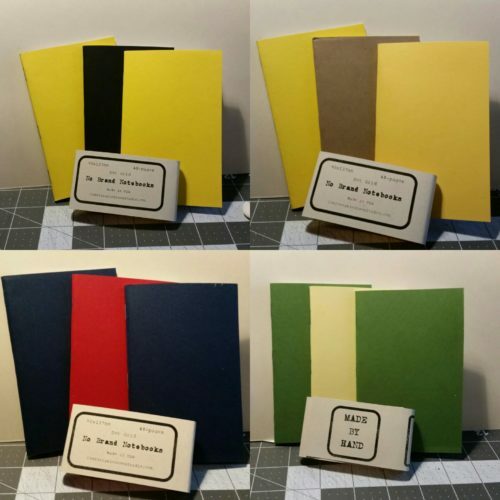 For those of you who have been here since the start, you own’t be surprised when I tell you that I’m making books again, specifically pocket notebooks. This was, after all, my bread and butter for a good long time. 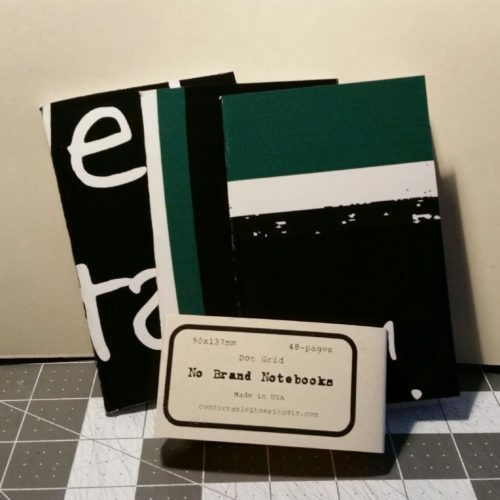 Hell, it’s why I started the blog- to discuss my nerdy interest in all things bookbinding. Well, age and labor caught up with me and I have carpal tunnel as arthritis runs in the family. There are times when I can’t pull a needle though a signature of paper. The act of making stations in my signatures can be excruciating. 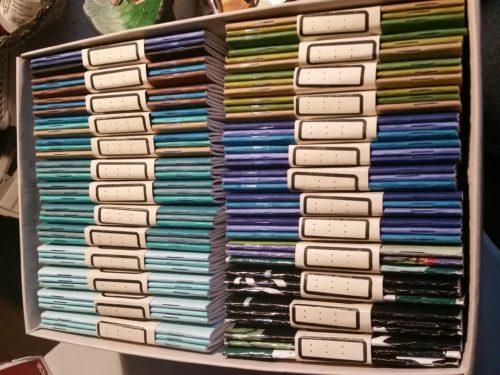 The last time I made a serious number of books, well my wrist was in pain for days and I realized that I cannot make books in the same manner that I once did, so I put away my awl, sign vinyl, and stopped hoarding reams of paper. Anyway. I picked up a long reach stapler off the clearance rack at staples a few years ago. 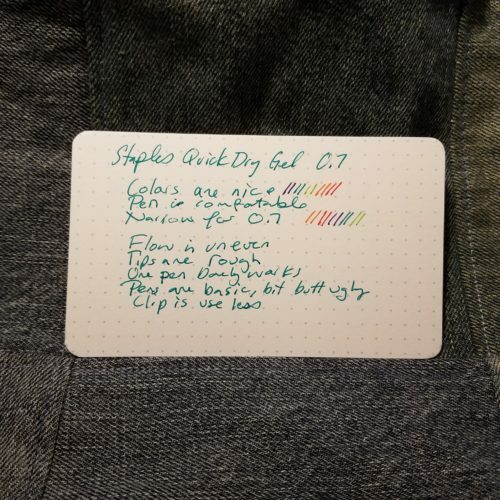 I let it gather dust until recently I wanted dot grid in a notebook and none of my hoarded Field Notes, Word Notebooks, or Story Supply Company had dot grid. I had some 24lb HP laser Jet from my experiment making my own planner books (still do this, still need to write a post about it) so I printed off some dot grid and pulled out that stapler and started making books. For the most part this is not bothering my wrists. Which makes me so happy. that said. 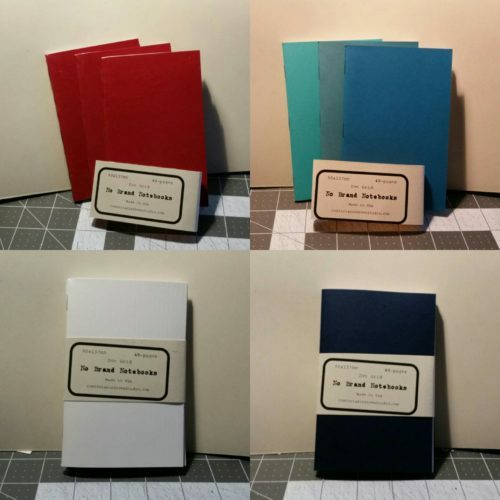 I’m happy to begin offering my notebooks again. You can find them on etsy here. 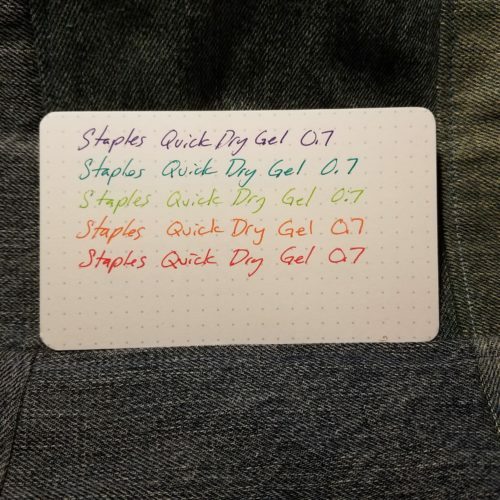 This entry was posted in technique and tagged bujo, bullet journal, dot grid, No Name Brand, notebooks, pocket on 20170314 by leslie.